that equal will be their life and their death? Ill is the judgment that they make. 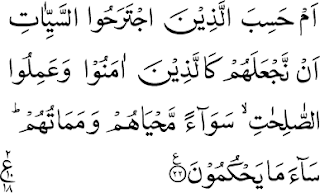 In the first verse (verse 21), Allah says that the Quran and the words of the Quran contain clear proofs/signs for humanity. If someone carefully studies it with Taqwa (fear of Allah, with piety), and in any aspect that he cares to study it, then, he shall therein certainly will find very clear evidence. Then Allah says it is a guidance and a mercy for the believers, for those who have faith (Iman), and who have a certainty in this book (and its words). 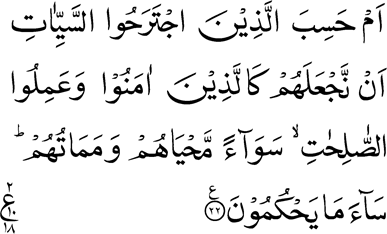 In another verse (verse 22), Allah says: “Do those who commit evils think that We shall hold them equal with those who believe and do righteous deeds - that equal will be their life and their death.” In other words, do those who do evil deeds think that We will give them the same treatment so that their lives and deaths become similar to the lives and deaths of the believers? No it’s impossible. For those who have faith (who are believers) and do righteous deeds, Allah will make them on this earth itself such treatment that will distinguish them from all others. And it is indeed such a treatment that shall be ongoing. So, the treatment which Allah reserves for the true believers is quite different from the treatment which the people who are immersed in evil shall receive. This treatment is different and it is distinguished and when you analyze this treatment closely then you will know for sure that those who are indeed recipient of this treatment are indeed the servants of Allah and that the others are from Iblis. 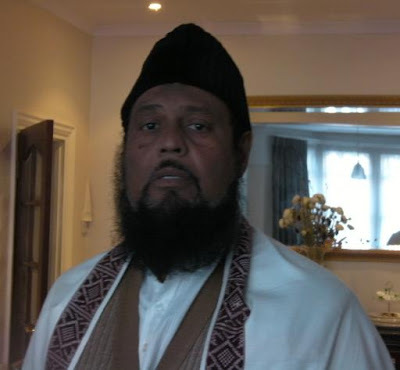 I most warmly thank you – guests and members of the Jamaat present – for answering the call of our religious society – Jamaat Ul Sahih Al Islam – and came today. By the grace of Allah (God Almighty), our religious society organised this conference today as part of the centenary of the advent of the message of a reformer of God named Mirza Ghulam Ahmad (as) – originating from India – in Mauritius. 1915-2015: It has been a hundred years since the message of Hazrat Mirza Ghulam Ahmad (as) came to our little island of Mauritius. His message was spread to the four corners of Mauritius and today there are thousands of followers (who believed in his message) and who are located in several towns and villages of Mauritius and also in Rodrigues. 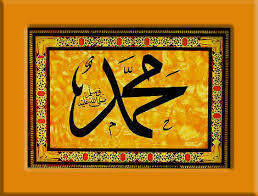 His coming was already prophesied in the Holy Quran and the sayings of the Holy Prophet of Islam, Hazrat Muhammad (pbuh). The Bible as well as the religion of Hinduism also prophesied about the coming of a reformer, and other great religions are still waiting for the advent of a reformer who will come for the reform of humanity. I’m sure that you, my Hindu and Christian brothers and sisters will agree with me that the world has entered the era of Kalyug (darkness), and therefore everyone is waiting for the promised Saviour/Reformer. 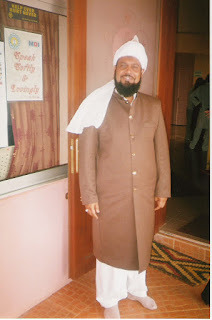 Then the Khalifatullah (atba) listed a series of evils which has gripped the present society, describing the actual Kalyug where people (men, women and children/youths) have abandoned Spirituality – the mosques and all places of worship – to grip the vices of this world such as drugs, gambling, fraud, corruption etc. People are now in places of worship only as a routine, but they are devoid of spirituality. 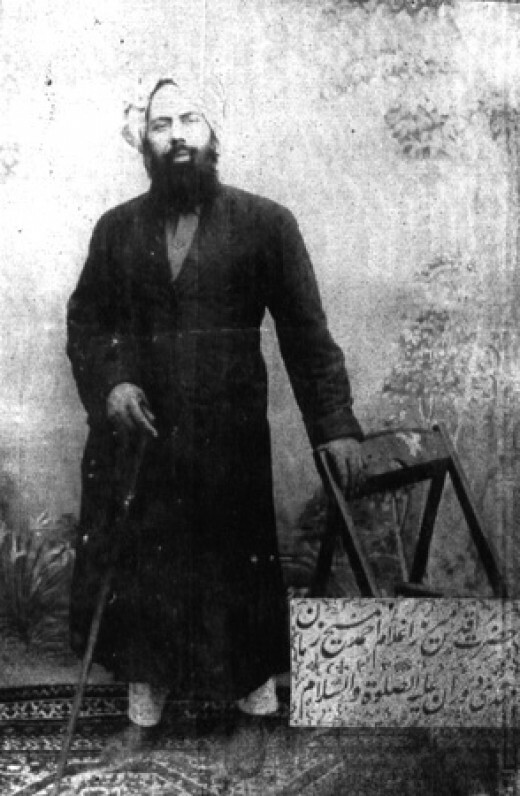 The Ahmadiyya Movement in Islam, founded by Hadhrat Mirza Ghulam Ahmad (as) of Qadian, originated in British India in the latter half of the 19th century. 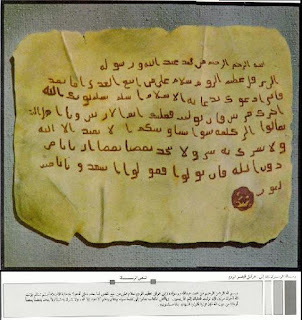 At a time when the spiritual crises of the Muslim world was graphically reflecting in the dismal political fortunes of the Muslim Ummah everywhere, Hadhrat Ahmad (as) announced his Divinely-ordained mission as the promised Massih of the Later Days and as the Al Imam Al Mahdi of the Fourteenth century of the Islamic Era, to rejuvenate the Faith. 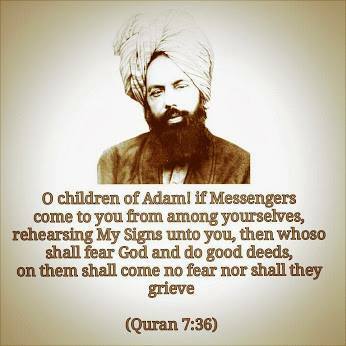 Muslims, who accepted his spiritual claims and enrolled themselves in the Anjuman, have come to be known as the Ahmadi Muslims. Although they constitute a miniscule minority within the larger Muslim population of 1.7 Billion, the different denominations of Ahmadis- including the Jamaat-e-Ahmadiyya Qadian and the Lahore Ahmadiyya Anjuman- are now found in almost all parts of the world. The birth of the Ahmadiyya Movement in the Indian subcontinent and the story of its remarkable spread abroad over the course of the last century represent an important Chapter in the religious history of our times. 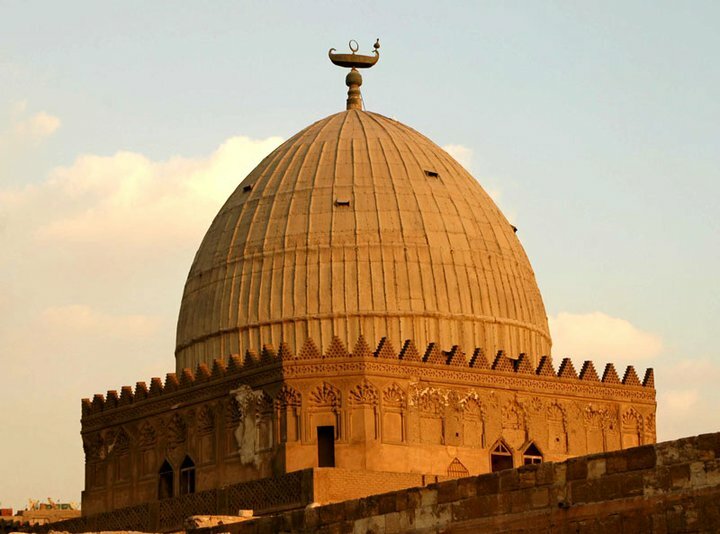 This episode from the modern, living history of man is a standing testimonial to the continuing spiritual appeal and religious vitality of Islam as a way of life. Ahmadiyyat expanded and revitalized the spiritual horizon of Muslims and others through its very outlook on important spiritual questions that troubles modern minds. 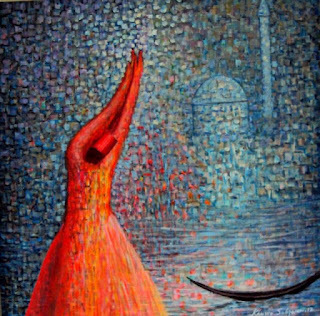 By bringing Divine Revelations back to the realm of individual spiritual experience and to the agenda of religious debates as an enduring, unstoppable path to the Divine, Hadhrat Ahmad (as) unveiled spiritual treasures long considered closed and forbidden. Islam’s original call of “Laa Ilaah Illallah” -(There is no deity, but Allah)- get revitalized every time Allah (swt) raises His Messenger with the Message and to be a practical model to the people of his times. In an illuminating essay, published as a special Book by the Jamaat Ul Sahih Al Islam International to commemorate the centennial of the Silsila Ahmadiyya in Mauritius, Hadhrat Khalifatullah Munir Ahmad Azim Saheb (atba), provides a fascinating glimpse into the early days of Ahmadiyyat in the Mauritius island located far away (from India), in the vast Indian Ocean. He portraits the devout souls of the Island who, despite all the hurdles of time and space, searched out for the vital signs of a living faith in the message of Ahmadiyyat and embraced it without hesitation, when they recognized the veracity of the promised Massih (as). Amaanah is honesty. Honesty is the respect of rights and commitments. It is also to assume one’s responsibilities. Responsibilities are a charge that Allah (twa) has entrusted to us. By fulfilling our responsibilities we render back trusts to the one who is entitled to it. Faith is an Amaanah. The practice of religious obligations such as Prayers (Salat), Fasting (Sawm), Mandatory Tax (Zakaat) Pilgrimage (Hajj) or even the Wudhu and Ghusl, is an Amaanah. To carefully learn the tenets of the Muslim faith and the laws of Islam is an Amaanah. To teach the Religion (Islam) is an Amaanah. To give sincere and dedicated advice is an Amaanah. Enjoining good and preventing evil, the Haraam (anything that is illegal) and injustices is an Amaanah. The opposite of Amaanah is Khiyaanah which is only betrayal, cheating, deception, falsehood and deceit. Thus, lying, fraud, deceit and deception are part of Khiyaanah. 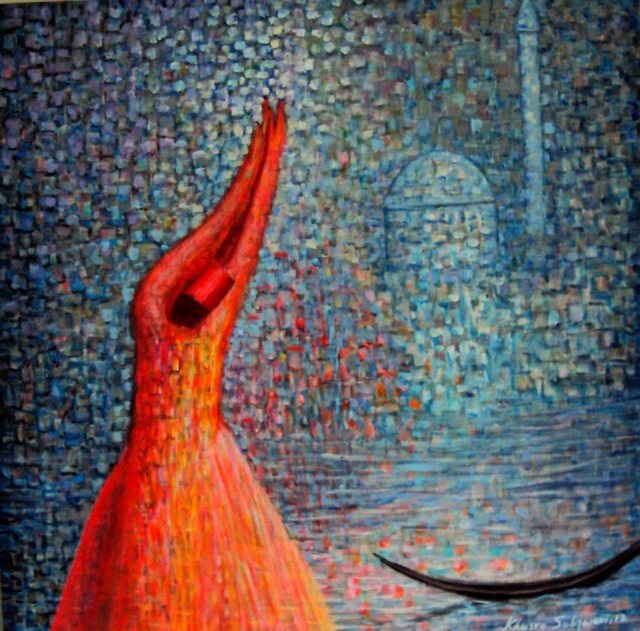 Amaanah is the characteristic of good, sincere and accomplished believer (Mumin). As for Khiyaanah, it is that of the hypocrite (Munafiq). The Amaanah which is summarized in the rights and assurance of responsibilities is even more important than charity and forms of supererogatory spending (for cause of Allah) or charity (Sadaqaat). Allah (twa) ordered to first pay off the debts of the deceased, which is a return of the Amaanah to those concerned. Second, beneficiaries of the bequest are to receive their shares, and at last there is the division of the inheritance between the heirs. Respect for the Amaanah is a character of the Prophets (as). 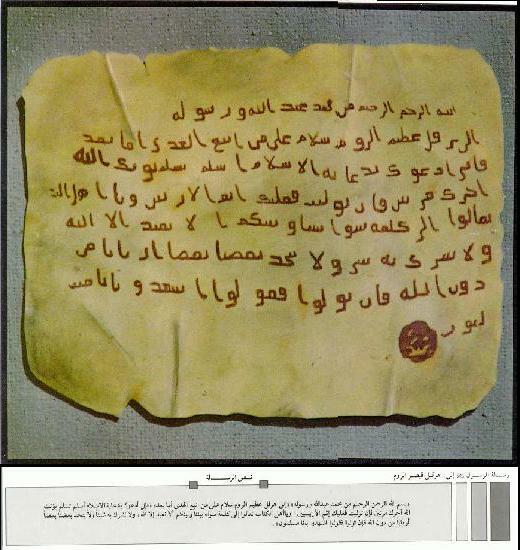 When our beloved Prophet Hazrat Muhammad (saws) had sent his letter to the Byzantine Emperor (Heraclius) and to invite his people to Islam, the latter wished to have accurate information about our beloved Prophet. He was in the land of Palestine; so he called the Arab traders who were there. Among them was Abu Sufyan which was still a disbeliever (Kaafir). It was him that the emperor questioned because he was an important dignitary of the tribe of Quraysh, the people of the Holy Prophet Hazrat Muhammad (saws). 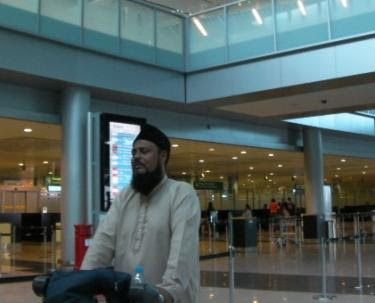 On 12 August 2015: After Tahajjud and Fajr prayers, Hazrat Khalifatullah Munir A. Azim (atba) left for the airport. 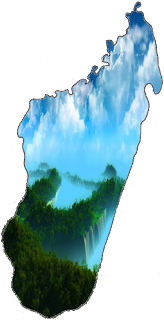 Flight for Madagascar (by Air Madagascar) was scheduled early in the morning. Upon reaching the big island, the Khalifatullah (atba) had to meet the Ministers of Foreign Affairs and Home Affairs respectively who were very busy. The meeting was very important for the Jamaat Ul Sahih Al Islam which by the grace of Allah was very successful. After the meeting, the Messenger of Allah learnt that at the airport, there was a group of our Muslim brothers, sisters and children from a neighbouring island who were facing lots of difficulties and their situation were deplorable. They were not receiving any flight back home after their transit (since many days) and nobody were looking after their needs and helping them. Each time their flight was cancelled. Therefore, the Khalifatullah (atba) gave this “Service to Humanity” work priority and went to support these people. A great blessed month has just left us; a month which each of us has no guarantee of seeing next year. All we can still hope is that Allah (twt) answers our prayers and supplications and accepts all our acts of worship (Ibaadat) and sacrifices made throughout the past month and grant us the promised rewards. Alhamdulillah (Praise be to Allah), the holy month of Ramadan has allowed Muslims to meet together, to converge en masse to the mosques, and besides they have committed themselves to fasting for the sake of Allah. Thus, the mosque found for the space of a month, its life and beauty. How to explain this phenomenon? What could be the explanation for this behaviour if it is not faith (Iman in Allah) the driving force behind it all! Indeed, who is that Muslim who does not know the grandeur, splendour and importance of this month? The Muslim knows that any negligence would lead to his own loss as the chief of all angels, Hazrat Jibreel (as) has cursed the person who has foregone this opportunity to get divine forgiveness. The head of all prophets (as), the “Amin” (Worthy of Trust) Hazrat Muhammad (pbuh) said “Ameen” to this curse. If the faith of the Muslim enables him to have high regard for this month, so where does his Iman (faith) disappear when the new moon of Shawwal appears (for the Eid), and when he deserts the house of Allah? If he knows the blessings of Allah (twt) that are included in the holy month of Ramadan, he must also know the blessings that are included in Salat (Namaz). If he is aware of the serious consequences of his carelessness during Ramadan, he should probably be also aware of the negative consequences resulting from the abandonment of Salat. Why then this carelessness, indifference towards this great Ibaadat which the Namaz is? We Muslims belonging to the spiritual family of Hazrat Muhammad (pbuh) and Islam have two festivals, two days of celebrations which Allah (twt) has given us as moments of joy and as a token of His love and satisfaction to the sacrifices we happily do for His sake, as per the fulfilment of His divine commandments. These two moments of joys are the Eid-ul-Fitr and Eid-ul-Adha. The Eid-ul-Fitr comes after the blessed month of Ramadan, the month of fasting for the sake of Allah with the intention to reap the harvest of Allah’s proximity and belonging to Him heart and soul. As for the Eid-ul-Adha, it is what is known as the greater Eid, the greater celebration as it concludes the Hajj rites and commemorates the great sacrifice of the Patriarch and Prophet of Allah, Ibrahim (as) and his devoted son Prophet Ismail (as). By the grace of Allah, after a month of Ramadan, we are to celebrate the Eid-ul-Fitr, Insha-Allah, tomorrow. This Eid (Joy) is of the essence of Allah and reflects the devotion of the faster who sacrificed himself and his way of life for a whole (lunar) month just for the sake of Allah, as fasting during this blessed month has as reward Allah Himself. 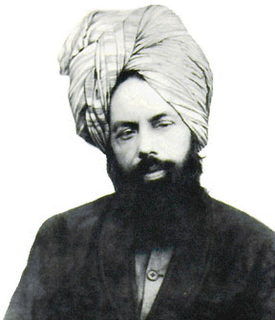 And by the grace of Almighty Allah, Allah has enabled us (Ahmadi Muslims) to be born Muslims and also belonging to the spiritual family and identity of the Promised Messiah Hazrat Mirza Ghulam Ahmad (as) who came more than 100 years ago with a rise of a new century to bring people from darkness into light. Money is not easy to obtain, especially if we mean the lawful source of money. Certainly, the acquisition of wealth requires great efforts. “One must work to earn his bread” is a phrase we hear very often. “It is He Who has made the earth manageable for you, so walk through its tracts and enjoy of the Sustenance which He furnishes: but unto Him is the Resurrection.” (67: 16). Allah is the Lord of immense grace, and all that is in heaven and on earth belongs to Him. Therefore, man must know that although he is the actor of his efforts, but all that which is in his hand really belongs to Allah. Allah is He Who has power over everything he is and everything he owns. Certainly man is not the true owner of the property/wealth which is in his hands. Allah exposes this fact very clearly in His Glorious Book: “And give them of the wealth of Allah which He has given you.” (24: 34). If this is the case, man must be very careful about how he spends his wealth. The Quran, best guide for humanity gives him better guidance about it. “Those who when they spend, are neither extravagant nor niggardly, but they hold a just balance between the two.” (25: 68). The believer should not be an extravagant spender and on the other hand, he/she must not also be stingy. He must hold firm to a just position between the two, practicing the middle way. Wealth is without a doubt a great trial, or even a great temptation. When a person accumulates money, he tends to make unnecessary expenses. Like the one who buys what he wants as and when he pleases without even reaping the benefit of this money/expenditure in any way. Otherwise he tries to have the money multiplied through illicit means or thrown in gambling without taking into account the great lost that awaits him both in this world and in the hereafter. Or he may spend this money in vain pursuits (reaping no benefit whatsoever) such as alcoholic drinks, cigarettes, giant screens (home cinemas), etc. Neither the existence of man nor his presence on earth is due to chance and without purpose. Its creation is a divine decree for specific purposes. Undoubtedly, and without exaggeration, he is the only creature whom the Supreme Creator, Allah has preferred to others. “And We have certainly honoured the children of Adam and carried them on the land and sea and provided for them of the good things, and conferred on them special favours, above a great part of Our creation.” (17: 71). His superiority over other creatures occurs in different ways: Allah granted him free will, and he has a spirit that allows him to distinguish good from evil. He has also a soul which has been created by Allah and which He has breathed into him to make him human, and holder of some divine attributes.